Chances are you started your essay telling about yourself in your essay, and missed the opportunity to reach out and grab your reader with a real-life anecdote that illustrates your point. And a good editor would spot this and encourage the writer to shift it to the top of the story. The idea was that you use the most interesting part to draw in the reader, otherwise, what was the point of sharing all the other information if you lose their attention and they stop reading? Same goes with these essays. 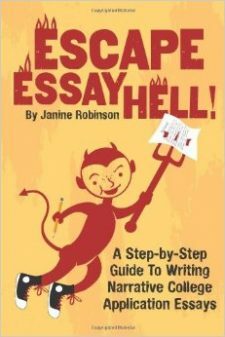 Most of the essays in my new collection of sample college application essays, Heavenly Essays, start with anecdotes. They are my favorite literary writing device when it comes to personal essays. They Show instead of Tell. Showing takes advantage of those concrete details that we can’t resist: the specifics of something that happened. Ooohhhh, who can resist the juicy stuff? Then the writer can “Tell” or explain, analyze, reflect, etc., on what happened later in the essay. One student, however, started her essay by telling about herself, and didn’t share a real-life example of her point until fifth paragraph. The essay was still strong and interesting (she was accepted to Middlebury College, a top liberal arts school in Vermont!). But I want you to see if you think it would have had a more compelling introduction if she started with her anecdote (and showed her point). The idea is that you scour your own writing for the juicy parts, the anecdotes, the interesting moments or real-life examples, and see if you can move them up to the top and start by showing instead of telling. Then go on to provide some background or context, and explain what they mean (telling). Where I come from being religious is unusual; Washington is considered the least religious state in the nation. Very few of my classmates go to church. The few who do probably would find my belief system rigorous and almost radical. Christian Science is most known for the practice of spiritual healing and for me, it is a way of life. It does not only come out in times of need, but is a part of my everyday existence and rids fear from each activity. Being a religious teenager in a highly secular place can be difficult. Sometimes I have to admit I dread the cliché questions of friends: What do you do when you get sick? Why don’t you go to the doctor? I can’t believe you have never taken any medicine! But I patiently answer these questions and embrace this challenge because spiritual living is crucial to who I am. For me, being religious doesn’t just mean going to church every Sunday; it is a daily practice and supports a fearless approach to life. Although I may stand out in a crowd, and many of my peers don’t understand my commitment to my religion, I don’t compromise my faith. I have overcome countless scenarios with the help of prayer, including the biking accident I experienced while training for a 350-mile bike ride from New York City to Washington, DC. (ANECDOTE) Biking along Lake Washington, the trees flew past me and the wind whistled in my ears. The dry smell of summer filled the air, and my legs churned up and down. The wind was at my back, and I felt like I was flying. Seconds later, however, I veered out of control. My bike and I hit the pavement and skidded across the road. After bandaging the scrapes and resting in bed, I actively prayed to be healed. Supported by my mom and a Christian Science Practitioner, my thought was transformed from fear of the accident to reassurance that I would be okay. My body certainly needed time to mend, but being freed from fear was the central benefit of this healing. I wasn’t afraid to get back on my bike, and I trusted that my cross-country season and school attendance wouldn’t be compromised by my accident. (Anecdote: Showing) Biking along Lake Washington, the trees flew past me and the wind whistled in my ears. The dry smell of summer filled the air, and my legs churned up and down. The wind was at my back, and I felt like I was flying. Seconds later, however, I veered out of control. My bike and I hit the pavement and skidded across the road. (Background: Telling) After bandaging the scrapes and resting in bed, I actively prayed to be healed. Supported by my mom and a Christian Science Practitioner, my thought was transformed from fear of the accident to reassurance that I would be okay. My body certainly needed time to mend, but being freed from fear was the central benefit of this healing. I wasn’t afraid to get back on my bike, and I trusted that my cross-country season and school attendance wouldn’t be compromised by my accident. (More background: Telling) Although my classmates and peers seemed surprised to see me active again, I knew that my quick recovery was because of my prayer. I rely on my relationship with God everyday, and not just to recover from accidents. For example, when presenting scientific research to an audience of Bahamian government officials last spring, I was fearful of stumbling through my speech. Turning to God, however, I found confidence and assurance that I could deliver my proposal with poise. So, what do you think? Did you like one version over the other? My advice is once you have pounded out a rough draft of your college application essay, read through it and if one part is really catchy and interesting, see if you can pop it at the top, and go from there. I think you might be surprised how much better it will be! Is it a good idea to start both UC personal statements with an anecdote? Or better to have variety between the two?